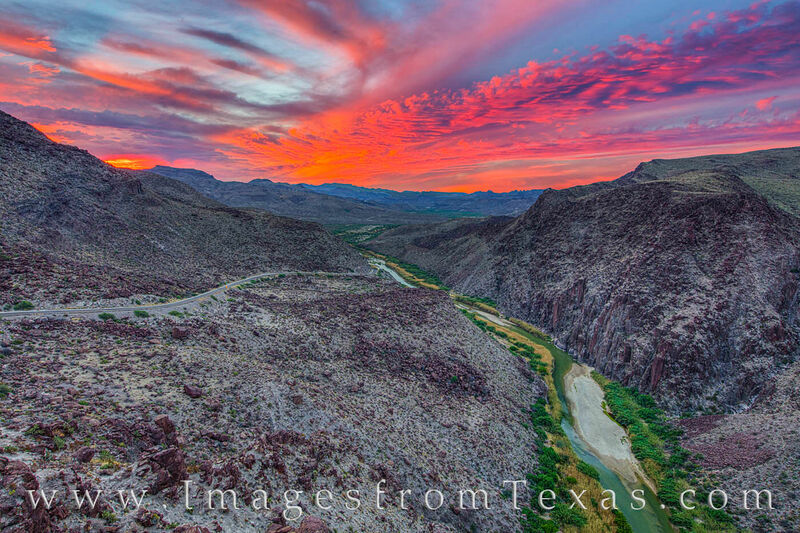 The Big Hill in Big Bend Ranch State Park can be found between Presidio and Lajitas. Two pull-outs along FM 170 – one for the view looking west and another looking east – are rarely crowded. Dom Rock, made famous by the movie, Fandago, is the eastern most pull-out. If you are adventurous, you can scramble up some rocks – perhaps 150 vertical feet – to the very top and enjoy views in all directions. This image shows the rugged Rio Grande as it flows east with Mexico on the south and Texas on the north. Overhead, the sun has yet to show itself, but its early light colors the sky in brilliant reds and blues.